The “Royale With Cheese Movie Club” – where I finally get around to watching movies that everyone else in the world has seen – has grown to the point where I’m actually getting recommendations of films that I should add to the Club. 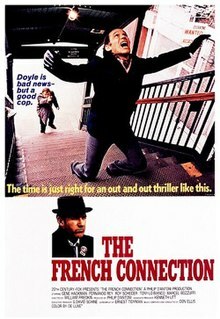 In fact, two of my loyal blog readers – Bennett Campbell and Girl “ate” – both suggested I watch The French Connection, the Gene Hackman-Roy Scheider cop film from 1971. A few minutes later, I’m sitting in my comfy chair and watching this film in the comfort of my home. Right away, I was amazed by the cinematography of this film. The film itself is a time capsule of a gritty, hardscrabble emotional New York City where every corner and every scene contains a host of grimy secrets. And fighting it all are two undercover antihero cops, Popeye Doyle and Cloudy Russo (Gene Hackman and Roy Scheider). Through their investigations, Popeye and Cloudy discover a possible shipment of pure heroin – maybe 60 kilos of it – heading toward New York from Marseilles, France. It’s a tense, tight drama – throughout the film, it’s evident that the cops and the feds are tailing the smugglers, while the smugglers are aware of the police and are trying to distribute their contraband without getting caught. Throughout the film, you’re not sure who’s the hunter and who’s the hunted. And then, at about 1:05 into the film, comes The Chase. If you’ve seen this film, you know what The Chase is. Popeye Doyle is chasing a sniper, who has escaped onto a subway car. Doyle commandeers a civilian’s car and starts chasing the elevated car through the streets of Brooklyn. Doyle dodges car crashes, he dodges a baby carriage, he smashes up that car like it’s in a demolition derby, and he still keeps pace with the runaway subway car to catch the sniper. Is it the best motion picture car chase scene? Well, I’ll determine that after I get around to watching Bullitt. Yep, that’s a future Royale with Cheese Movie Club film. And of course, the film ends with the brutal shootout at the warehouse. You would think that a police drama would end with the cops catching the bad guy, but that’s not how it ended. It’s almost like a two-hour version of The Wire, where the bad guys sometimes win and the good guys sometimes lose. Or if there really are purely good guys and bad guys in this world. Maybe that’s why this film resonates with so many people and still holds up well today. Although I’m still scratching my head about the references throughout the film to picking your feet in Poughkeepsie. Anyone care to explain that to me?